If you didn't guess, this web site is all about lottories. Playing lotto, Winning lotto. We all dream about winning millions but know that the odds of actually striking the right numbers are at least 1 in lots of digits etc. And yet the dream remains, richer by the day. So are there ways to increase your odds of winning ? Can you make it more likely that you will be the big jackpot winner ? This site will help you explore the various methods, techniques and computations that are flying around to help improve your chances. Show you the places to play lotto online. And the some of the things to avoid. Lotto Strike is an add-on game that can only be played with Lotto. To enter, you must first add a Monday, Wednesday or Saturday Lotto entry to your basket. Lotto Strike is won by selecting four numbers that correctly match the exact order of the first four Lotto balls drawn. If you match the four balls correctly, you can Strike It Rich with a minimum prize of $100,000 - and more when there is a Lotto Strike jackpot! And if you match just one, two or three of the first four Lotto balls, in exactly the same order drawn, you'll also be a divisional winner. For Powerball, 2 sets of numbers are drawn from 2 machines, first contains 40 balls numbered from 1 to 40 inclusive and the second one contains 20 balls numbered from 1 to 20 inclusive. For a standard game, you choose 6 numbers from the first range of 1 to 40 and a Powerball number from the second range of 1 to 20. In total, the machines draw 7 numbers. Firstly, the 6 winning numbers which are drawn from the first barrel of 40 numbers and secondly 1 Powerball number which is drawn from the second barrel of 20 numbers. The Pools is based on Australian and European soccer matches. You don't need to know anything about Soccer though - it can be played just like a normal lottery game. Each week, 38 matches are listed and numbered 1 to 38 inclusive. For a standard game you choose 6 numbers from the range of 1 to 38. Saturday Lotto numbers are drawn from a machine containing 45 balls numbered from 1 to 45 inclusive. For a standard game, you choose 6 numbers from this range. Just like a raffle, each Lucky Lotteries Super Jackpot has a set number of ticket numbers to be sold (225,000). Once all are sold - i.e., the lottery has been fully subscribed - the draw for that particular lottery can take place. You may choose to be allocated either random (to a maximum of 5) or sequential ticket numbers - but you can’t select your own numbers. Each lottery has a jackpot prize, which continues to grow until won. Just like a raffle, each Lucky Lotteries Mega Jackpot has a set number of ticket numbers to be sold (180,000). Once all are sold - i.e., the lottery has been fully subscribed - the draw for that particular lottery can take place. You may choose to be allocated either random (to a maximum of 5) or sequential ticket numbers - but you can’t select your own numbers. 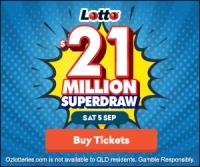 You can learn how to win the lottery in Australia or any other country with proven lotto strategies. 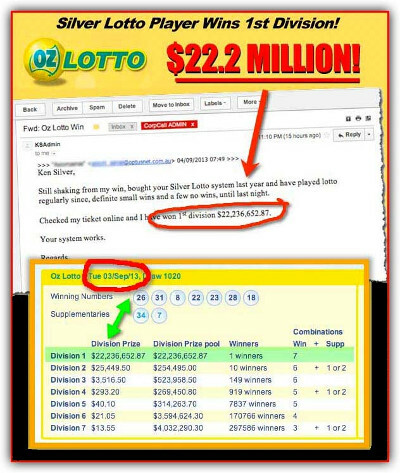 Learn how to win on the lotto with these proven lotto strategies that have worked for over 130 people. Are you the next big lottery winner? American and Australian players that are interested in lotto are also into real money online casino games found at http://www.mobilecasinoparty.com and other gambling websites. If you are not interested in poker software , then you have already missed a lot. Did you know that you can learn how to pick winning lottery numbers in any lotto draw? Learning how to win the lottery has never been easier.